Why campaigning and quality literature don’t necessarily go hand-in-hand. Hoover Institution fellow Elizabeth Cobbs discusses her and James Shelley's new PBS documentary, "Cyberwork and the American Dream." The Hoover Institution hosted "Security by the Book with Henry Farrell & Abraham L. Newman" on Tuesday, April 23, 2019 from 5:30 PM – 6:30 PM EST. (Part 1) Hoover Institution fellow Richard Epstein discusses his Defining Ideas article "Does Capitalism Cause Social Decay?" (Part 2) Hoover Institution fellow Richard Epstein discusses his Defining Ideas article "Does Capitalism Cause Social Decay?" Hoover Institution fellow Bill Whalen discusses his Forbes article "Now That Bernie Has Discovered Fox News, Will He Further Explore Red-State America?" 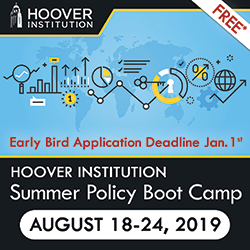 Hoover Institution fellow John Yoo discusses the anti-Trump dossier and how it has been completely repudiated by the Mueller report, and what will happen next. Hoover Institution fellow Tunku Varadarajan discusses his Wall Street Journal article "Behind the Easter Sunday Attacks in Sri Lanka."